I still can't believe we just celebrated two years of marriage yesterday! Two years seems like so long, but also so so short. We celebrated with dinner on Friday, because Tanner had an interview this weekend, and our anniversary was on a Sunday. Tanner surprised me with dinner at a new restaurant (it's seriously our favorite thing to do) in downtown SLC. It's called Bambara, and it was so absolutely delicious. We couldn't stop talking about it afterwards! 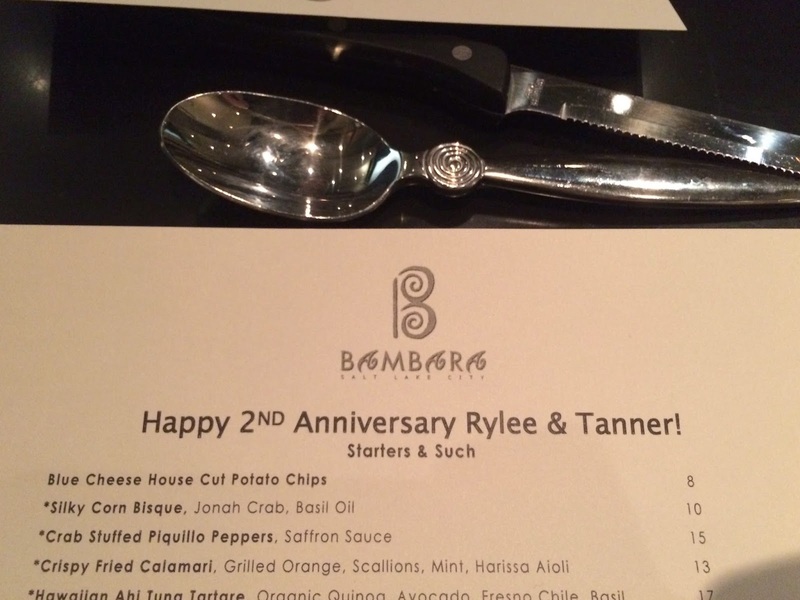 They even personalized our menu for us-it was so cute! you can see the open kitchen behind me-i loved that! and, look at how darling the seats are! classic hand holding-at the dinner table-pic. the best. it was such a classy looking restaurant. After dinner we got to walk around and enjoy the beautiful fall colors, the brisk air, and the city! I just trimmed my bangs don't you worry. I love that my husband is my best friend, and these have been the best 2 years of my life!